Electronic tax filing for individuals was used first in 1986. In that year, only five preparers participated in the program and approximately 25,000 returns were filed electronically. By 1993, the number of returns filed electronically had grown to more than 14 million, or nearly 12% of all returns filed. In 2001, an estimated 46 million tax returns were filed electronically. This means, however, that almost 66 million individual tax returns were not filed electronically. While this may indicate that more and more individuals are likely to use electronic filing, it also appears that they are in no hurry to do so. The IRS’ stated goal is to have 80% of taxpayers filing electronically by 2007. At first, only very simple individual returns that were entitled to a refund could be filed electronically. By 1993, however, a fairly complicated return with numerous schedules and forms could be filed electronically. Furthermore, taxpayers could owe taxes and still file electronically; but any taxes owed still had to be paid by the due date of the return. Many partnership, estate, and trust returns now can be filed electronically. Taxpayers can receive a fast proof of acceptance using their own Personal Identification Number. The cost of filing using the IRS’ e-file partners has decreased significantly. Electronic payment options using a credit card are now available. E-filing still contains certain drawbacks. First and foremost, electronic filing still leaves out taxpayers that may wish to file directly from their home personal computers at no cost. The no-cost option provided to e-file participants is for use by low-income taxpayers, often with very simple returns and a gross income of $25,000 or less. The only other free filing offered is through institutions such as mutual funds, insurance companies, brokers, and banks that often provide the software as a service to their clients. Second, the e-file program is still restricted to service providers accepted by the IRS. This leaves out smaller tax-service providers that cannot afford or are not equipped to participate. The e-filing process is not completely paperless. Many forms must still be filed on paper. Although many partnerships and estates can now use electronic filing, other entities, such as legal and illegal aliens, taxpayers under the age of 16, corporations, and decedents’ estates, still cannot do so. 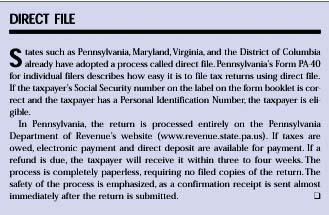 Finally, 10 years ago, e-file participants only needed to know one simple revenue procedure. Today, e-filers must comply with Revenue Procedure 2000-31, IRS Publications 1345, 1345A, 1346, 1436, 3112, the IRS Digital Daily, and any postings on the IRS’ website regarding electronic filing. Other questions about the success of e-filing abound. How many of the 46 million taxpayers who filed their returns electronically in 2001 did so to get the faster refund and would not have done so if they owed taxes? How many were young individuals with little income, who were not charged for the filing and had a refund coming? Until large numbers of those who owe taxes start to use it, and individuals can file directly with the IRS at no cost, electronic filing still has a long way to go. The specific requirements to become a participant in the electronic filing program have not changed significantly since the early 1990s. In addition to the information long since required on Form 8633, Revenue Procedure 2000-31 requires a completed fingerprint card, proof of professional status, and the signature of a responsible official. Taxpayers must also pass a suitability check as required by the IRS and state and local governments. Electronic filers must maintain a high degree of integrity, compliance, and accuracy. E-filers must ensure that returns are accurately and efficiently filed. E-filers are required to stay current with all relevant IRS pronouncements. The IRS feels these rules and restrictive guidelines are necessary to enhance the image and credibility of e-filing, as well as to protect the taxpayer from the many possible abuses of this program. Since the IRS hopes e-filing will become the primary way tax returns are filed in the near future—and eventually the only way a return may be filed—there must be assurances that returns are complete and accurate and are filed efficiently. While most of the responsibilities and penalties for noncompliance have remained in place since the early 1990s, a few additional measures have been taken by the IRS to improve the monitoring of the electronic filing program. The IRS’ primary responsibility is to ensure that complete returns are filed on or before the due date. To further protect the public, the IRS has procedures that must be followed specifically depending upon the type of participant. The IRS can perform suitability checks at any time and deny participation to any provider that does not meet the published requirements. Authorized IRS e-filers, except software developers, are tax return preparers under the original IRS definition in Revenue Procedure 2000-31, section 6.01(01). Under Revenue Procedure 2000-31, Sec. 7.01, the IRS may sanction any provider who fails to comply with any provision of the Revenue Procedures or publications. Preparers are subject to criminal penalties for the disclosure or use of the tax return information, in addition to any civil penalties. Subjecting providers of electronic filing to the wide range of disclosure rules and preparer penalties provides taxpayers with the same confidence they should have in a CPA, enrolled agent, or other tax preparer. The IRS has recently announced that as many as 78 million taxpayers will be able to file their federal tax returns electronically and free of charge in the near future. This service, according to CCH Federal Tax Weekly, will be provided under an agreement between the IRS and a consortium of tax preparers and software publishers. This is the first attempt to implement the IRS Restructuring and Reform Act of 1998, especially Section 2001(c), which sets forth Congress’ belief that a comprehensive strategy to encourage electronic filing of tax returns should be implemented. The result is the “Free On-Line Electronic Tax Filing Agreement,” signed by the tax preparer consortium and the IRS. The agreement will provide free online tax return preparation and filing services to individuals for the tax filing seasons, beginning with the 2003 tax year. The IRS took a major step in the right direction under Section 2001(c) of the IRS Restructuring and Reform Act of 1998. The overall process, however, has become much more complicated, for both providers and filers. The new agreement must simplify the numerous regulations, or individual taxpayers may still shy away from e-filing, regardless of the cost. Paper-filed returns will remain the norm until e-filing’s burdensome procedures are simplified and the ability to file electronically is broadened. Allen J. Rubenfield, CPA, is an assistant professor of tax and accounting at Clark Atlanta University. Ganesh M. Pandit, CPA, is an associate professor of accounting at Clark Atlanta University.